Compare Editions, Download, Release Notes, and User Guide. This week ransomware got even nastier, with a new levels of proliferation. Being around a bunch of storage and availability experts this upcoming week at VeeamON is great timing, should make for some interesting conversations, even if this particular attack is mostly hitting older versions of Windows. WannaCry (or WannaCrypt, WanaCrypt0r 2.0, Wanna Decryptor) is a ransomware program targeting Microsoft Windows. On Friday, 12 May 2017, a large cyber-attack using it was launched, infecting more than 230,000 computers in 150 countries, demanding ransom payments in the cryptocurrency bitcoin in 28 languages. WannaCry is believed to use the EternalBlue exploit, which was put into open access by Wikileaks, and was allegedly developed by the U.S. National Security Agency (NSA) to attack computers running Microsoft Windows operating systems. Patrick Norton on May 12 2017 DTNS 3029. Decommissioned for years, Windows XP, 8, and Server 2003 get emergency update. Ransomware attack appears to be targeting institutions in several European countries. 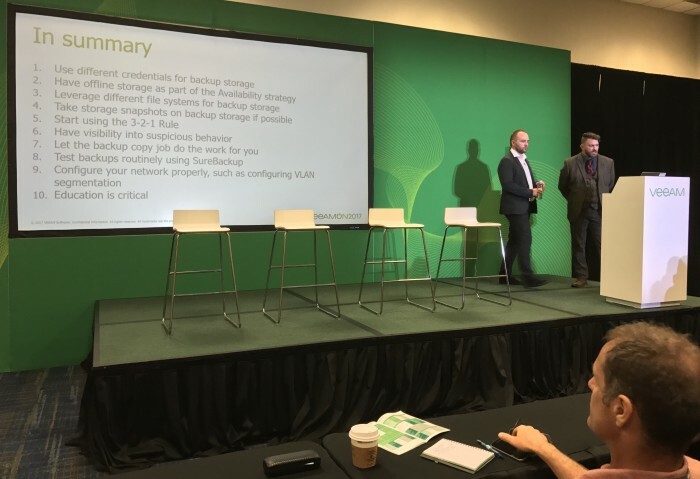 What is Veeam doing to help you protect yourself? Veeam Endpoint Backup FREE 1.5 is here! From what I remember, we planned and even implemented the option to auto-mount, but mounting did not work reliably enough for including this feature into the release, and the issue was not due to our bugs (there's very little code required anyway). May be Dima can provide more details on what exactly did not work. When automatic USB disconnect is enabled, VEB 1.5 requires the user to physically unplug then plug in again after each backup for the next backup to happen. 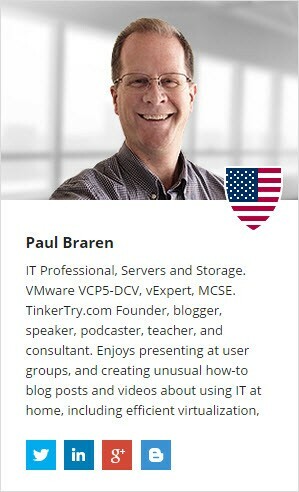 I've also been experimenting with auto-VPN reconnect for one of my VEB-on-Dell-XPS15-equipped sons away at college, but recent data caps implemented by Cox here in Connecticut make such personal cloud schemes challenging. Argh. Even better would be scheduled VPN used just for backup windows, see more product feedback/ideas here. 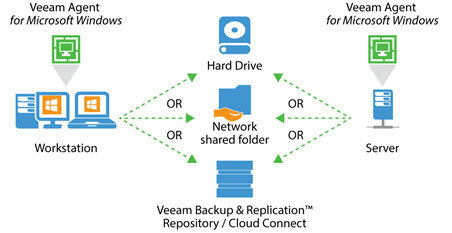 Backup from VEB to Veeam backup repository is done through the proprietary protocol. There is no need to open up ports for SMB traffic between EP client and VBR server, as SMB traffic only flows between the gateway server specified in shared folder repository setting, and the share. While source data mover (running on the endpoint) and target data mover (running on the gateway server) chat with each other using the proprietary protocol. So, you're safe until someone builds CryptoLocker that is specifically designed to attack Veeam repositories. Veeam Agent for Microsoft Windows 2.0 Public Beta is NOW Available! with Anton Gostev's forum announcement here, will have to see what changes are made when that becomes GA very soon. Finally, there's Veeam Availability Suite including Veeam Backup & Replication, which VEB and Veeam Agent physical systems can use as a backup target. Seems to offer the same advantages of avoiding SMB attacks, and allows centralized daily backup management. I'm sure ransomware will work its way into multiple presentations that I'm headed to this week. Ultimately, it's up to you, the IT Pro typically holding the responsibility for trying to keep your family and friends reasonably safe. That's quite a challenge. At least Veeam is trying to help you in this difficult task, and offers IT Pros the needed bits to test for themselves, with no time-bomb. So, all hell broke loose with NSA exploits-based ransomware impacting all businesses worldwide (including my cellular operator), just like I've predicted in this very digest 3 weeks ago. But honestly, it was easy to see coming. I hope all of you are safe having received the advanced warning, and this will teach the rest to subscribe to Veeam forums digest! One thing I did not expect is Microsoft releasing [patch against ETERNALBLUE exploit]() for all unsupported systems including Windows XP, which speaks highly on the caliber of this threat. This mess deserves the dedicated digest, but unfortunately I have over 9000 other deliverables to work on with VeeamON starting in just 2 days, so I have to keep this one short. Although from another perspective, these events are quite "fortunate" for Veeam, as it's hard to imagine a better lead into the World's Premier Availability Event (that is according to the banners in MSY airport, were I've just landed). While this particular wave of ransomware is affecting older Windows versions, there have been plenty of ransomware attacks on modern OSs through to Windows 10 as well, such as CryptoLocker. Phrasing of opening paragraph adjusted accordingly. Tooks some pics here at VeeamON 2017. Yes, tape is still your best recourse to gain true air-gapping, just having a Linux-based repostory isn't quite enough. VeeamON 2017 has some remarkable technologists, and I'll be there! Nov 22 2016, with full vSphere 6.5 support arriving Jan 20 2017. WannaCry ransomware spreads aggressively across networks, holds files to ransom. Veeam Backup & Replication 7.0 Patch 4: VSAN support!